These birds are also known as Red Birds or common cardinal. 1918-scientific name changed to Richmondena cardinalis. 1. The genus and species names, Cardinalis cardinalis, are Latin words pertaining to a door hinge. 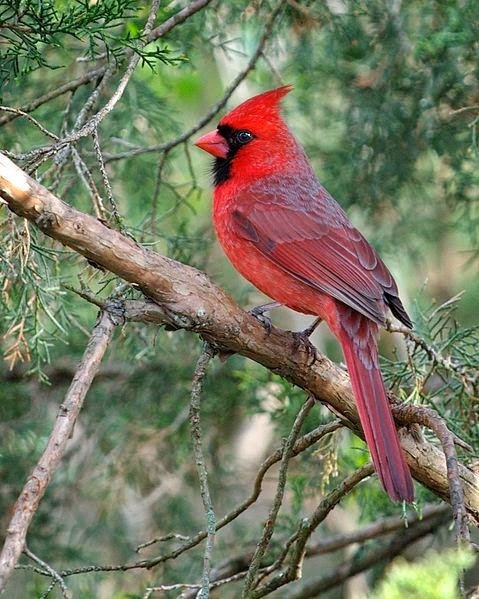 Cardinals were named for the rich, bright red color found in the males, the same color as the robes worn by the cardinals of the Catholic Church. The cardinals of the Church are important to the Pope in that many essential matters are dependent on, or hinged on, their decisions. breeding territory from other males. When a male sees its reflection in glass surfaces, it frequently will spend hours fighting the imaginary intruder. 3. The male Northern Cardinal is perhaps responsible for getting more people to open up a field guide than any other bird. They’re a perfect combination of familiarity, conspicuousness, and style: a shade of red you can’t take your eyes off. Even brown females sport a sharp crest and warm red accents. Juvenile (young) cardinals have a black bill and it changes to orange, then to red, as they become adults. 4. Cardinals don’t migrate and they don’t molt into a dull plumage, so they’re still breathtaking in winter’s snowy backyards. In summer, their sweet whistles are one of the first sounds of the morning. 5. Northern Cardinal's are “State Birds” in seven (7) states: Illinois, Indiana, Kentucky, North Carolina, Ohio, Virginia, and West Virginia. 6. Their beak is very strong and powerful, and great for sunflower seeds, fruits, berries and insects. They are Omnivores. It also will drink sap from the holes drilled by sapsuckers. 7. Cardinals hop rather than walk on the ground. 8. Medium songbird (8-9 inches from bill to tail) with large crest and heavy, orange-red seed-crushing red bill. 9. Deep black face mask around eyes and base of bill. 10. Male entirely brilliant red with a grayish tinge on wings and tail. Prominent large face mask. 11. Female grayish-tan with a red wash on tail, crest, and wings. 12. Song a series of clear, pure-toned whistles, the first down-slurred and ending in a slow trill. Cheer, cheer, cheer, what, what, what, what.Call a sharp chip. 13. 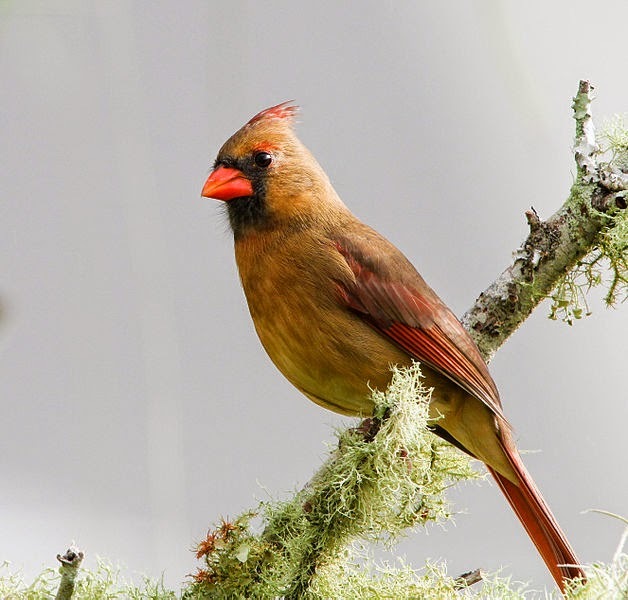 Most female songbirds do not sing but female cardinal do, often from the nest. The song may give the male information about when to bring food to the nest. A mated pair shares song phrases, but the female may sing a longer and slightly more complex song than the male. 14. The cardinal’s red color comes from eating carotenoid pigments in its food during molt and may signal mate vigor. Brighter red males hold the best territories, get more to eat, and have greater reproductive success than duller males. 15. Generations of neighbors share their song repertoires with very little improvising and copying errors. 16. Only a few female North American songbirds sing, but the female Northern Cardinal does and often while sitting on the nest. 17. Many people are perplexed each spring by the sight of a cardinal attacking its reflection in a window, car mirror, or shiny bumper. Both males and females do this and most often in spring and early summer when they are obsessed with defending their territory against any intruders. Birds may spend hours fighting these intruders without giving up. A few weeks lat-er, as levels of aggressive hormones subside, these attacks should end (though one female kept up this behavior every day or so for six months without stopping). 18. Monogamous and solitary. The male feeds the female during courtship and while she is incubating the eggs. 19. Did you know that once they find a home, they usually stay in the same area for the rest of their lives? These are just interesting facts about the life of the Northern Cardinal. 20. Males sometimes bring nest material to the female, who does most of the building. She crushes twigs with her beak until they’re pliable, then turns in the nest to bend the twigs around her body and push them into a cup shape with her feet. The cup has four layers: coarse twigs (and sometimes bits of trash) covered in a leafy mat, then lined with grapevine bark and finally grasses, stems,rootlets, and pine needles. The nest typically takes 3 to 9 days to build; the finished product is 2-3 inches tall, 4 inches across, with an inner diameter of about 3 inches. Cardinals usually don’t use their nests more than once. 21. Most small birds only live for a year or two. One cardinal was caught almost 28 years after it was initially banded. 22. Males care for the first brood while the females are incubating a second clutchin a new nest. 23. Cardinals are colorful, tolerant of people, have pleasant calls, and are easily attracted to bird feeders. That has made them a favorite of backyard birdwatchers all over the eastern half of the U.S.
24. Cardinals may form winter flocks of 60-70 birds. 25. Females usually sing after males establish territory but before nesting starts.